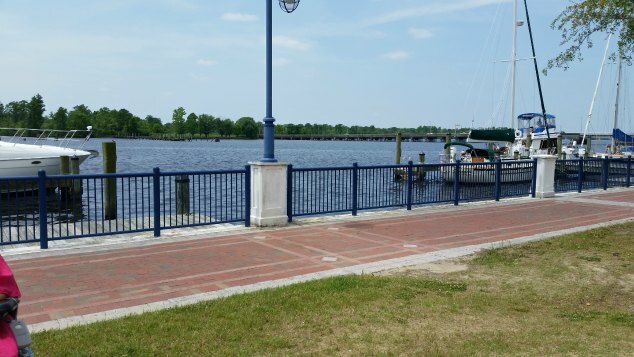 Walk one block from the waterfront of Little Washington on Water Street and you’ll discover the hidden gem of an art studio where pleinair painter Art Tyndall sells his creations. I stumbled into Art’s studio a few years ago while visiting my aunt, and I make a point to visit his studio on every trek across the state. Art’s studio is a 15×25′ store-front where light streams through the transom windows and his original oil paintings fill the bead – board walls. Looking at the tidewater landscapes, figures and local buildings, you can feel the joy that Art pours from his brush to the canvas. Many would consider painting a second career for Art as he started his self-taught venture at the age of 50. Each piece that Art creates is one-of-a-kind and very personal. While he enjoys selling his work, even if he did not sell, he would continue to paint. His prices range from $150 to $2,000 and you can commission a special request by contacting him at arttyndallstudio@gmail.com or by visiting him in person at the Water Street Studio on the waterfront of historic Washington, North Carolina. Stop by, say hello and tell him that Janet sent you. I forgot to take him a jar of homemade blackberry jelly, but that’s a great excuse for me to visit in a few months. 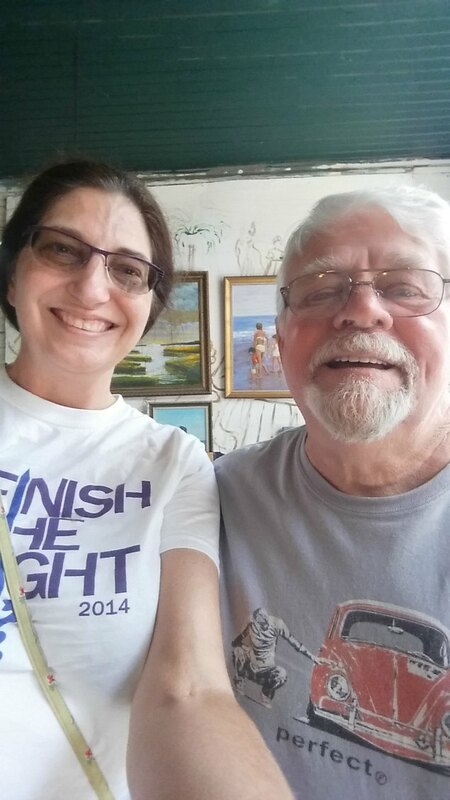 Many thanks to my dear friend, Janet Morgan, who introduced me to Art’s art and shared his story with us here at Handmade NC. I’m something of an audiophile and couldn’t let International Guitar Month slip by without creating a list of famous North Carolina musicians who have graced the airwaves. This is a list I certainly enjoyed creating and hope you enjoy it as much as I did creating it. 1. James Taylor — While Sweet Baby James wasn’t born in North Carolina, we heavily associate him due to the time he lived here and the one song that brings me to tears each time I hear it, “Carolina in my Mind.” In this video he explains that he wrote the tune due to homesickness and that is all we need to know. He’s a Carolina Boy. He was inducted into the North Carolina Music Hall of Fame in 2009. 2. Ben Folds — Ben is a multi-talented Winston-Salem native who plays all of the instruments on the song I’m sharing next “Rockin’ the Suburbs.” The littles in your life will recognize this tune from the movie “Over the Hedge.” He was inducted into the North Carolina Music Hall of Fame in 2011. 3. Blind Boy Fuller — It would not be a list without adding Wadesboro, NC’s own Blind Boy Fuller. An American blues guitarist and vocals, he was one of the most popular of the recorded Piedmont blues artists. I particularly enjoy this track as it sounds like multiple guitar tracks were layered, but that technology did not exist until the 1950’s. He got his name after going blind in 1928 due to the long-term effects of untreated neonatal conjunctivitis. 4. Doc Watson — I grew up listening to bluegrass and it is the music of my soul. I am thankful to have watched Doc Watson perform more times than I can count. Born in Deep Gap, NC, and an eye infection caused him to loose his sight before his first birthday. According to Watson on his three-CD biographical recording Legacy, he got the nickname “Doc” during a live radio broadcast when the announcer remarked that his given name Arthel was odd and he needed an easy nickname. A fan in the crowd shouted “Call him Doc!” presumably in reference to the literary character Sherlock Holmes’s sidekick Doctor Watson. The name stuck ever since. I’m sharing Doc’s final performance on April 29, 2012, at Merlefest, accompanied by the Nashville Bluegrass Band. Doc was inducted into the North Carolina Music Hall of Fame in 2010. 5. Edward “Little Buster” Forehand — Little Buster was born in Hereford, NC. He was an immensely talented blues guitarist and soul singer. Like Doc Watson and Blind Boy Fuller, he was sighted, but developed glaucoma at age of three. By the time his vision was completely gone, he was fluent on six instruments, including the guitar. His music is evocative of the 60’s sound and makes you want to snap your fingers and sway along. 6. Elizabeth Cotten — Born in Chapel Hill, Cotten was a self-taught left-handed guitarist. “Her approach involved using a right-handed guitar (usually in standard tuning), not re-strung for left-handed playing, essentially, holding a right-handed guitar upside down. This position required her to play the bass lines with her fingers and the melody with her thumb. Her signature alternating bass style has become known as ‘Cotten picking’.” If you love finger picking on the guitar, you’re in for a treat. 7. Etta Baker — Another great Piedmont Blues guitarist was Etta Baker, born in Caldwell County, NC. She played both the 6-string and 12-string forms of the acoustic guitar, as well as the five-string banjo. Baker played the Piedmont Blues for ninety years, starting at the age of three. Her skill, like Elizabeth Cotten’s leaves me a little breathless. 8. Tal Farlow — Self-taught jazz guitarist Farlow was from Greensboro, NC. “Nicknamed the “Octopus”, for his extremely large hands spread over the fretboard as if they were tentacles, he is considered one of the all-time great jazz guitarists.” He learned how to play on a ukelele which influenced his playing throughout his career. I’ve only recently started listening to the work of Farlow, but find it a refreshing change from some of the other jazz artists I have on heavy rotation. 10. Chuck Brown — Born in Gastonia, NC, Chuck Brown was the “Godfather of Go-Go,” a funk music sub genre originating in the Washington, DC, area. If you want some amazing music that will get a crowd out on the dance floor, play Chuck Brown and dare them not to dance. Here’s Chuck performing at the 9:30 club in Washington, DC. This is by no means a comprehensive look at North Carolina guitarists, but is a snippet of the great musical talent from the Old North State. Share your favorite North Carolina guitarists and musicians in the comments. 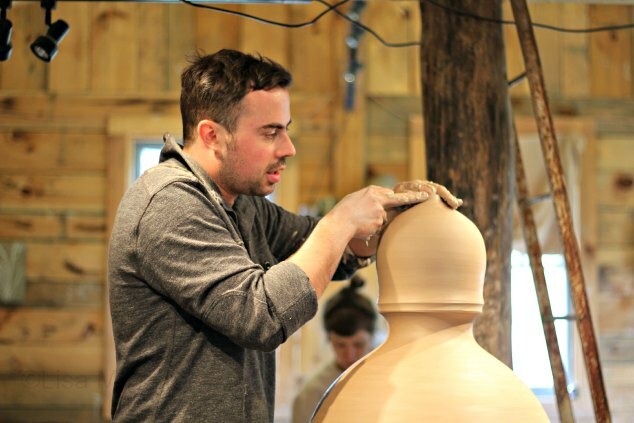 This is the first piece in my series on East Fork Pottery which will extend throughout 2015 and the first in our new series on North Carolina pottery and the artists who create it. 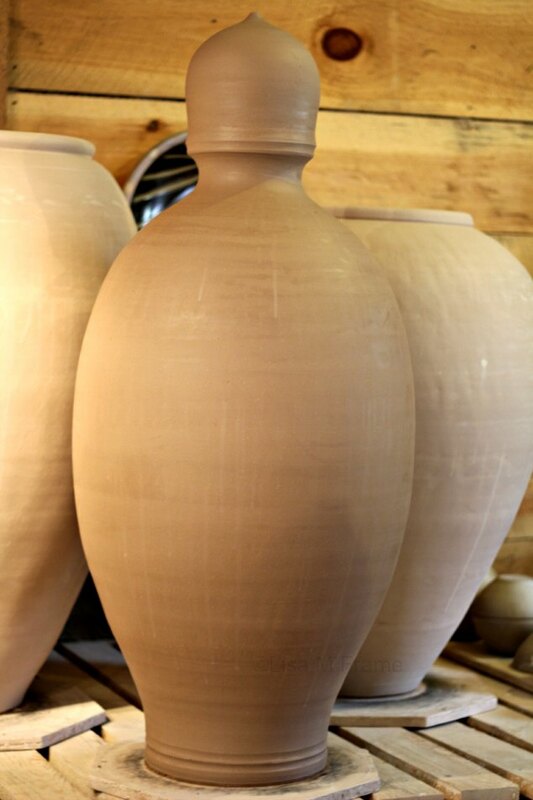 I recently traveled north of Asheville to meet with the founder of East Fork Pottery, Alex Matisse. 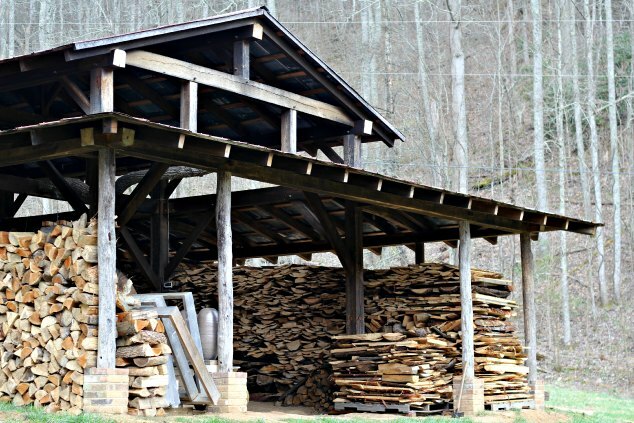 A google search led me to his website and I found myself winding up the mountain a few hours from my home in Charlotte, NC, on a bucolic, curvy two-lane road in Madison County. This idyllic scene was compounded by burgeoning spring buds and a rushing brook, all beckoning me to my final destination. Tires crunched on the gravel as I slowly made my way up the short drive to the East Fork workshop, the massive kiln sitting in silent greeting. Awestruck does not begin to describe my feelings as I took in every inch of the property with it’s massive stacks of firewood ready to fire the kiln, chickens clucking, Zuma barking, and beautiful glazed stoneware staring at me from open doors. As I pulled out my gear, I mentally prepared myself to meet Alex, CFO/Moral Compass/Potter John Vigeland, and apprentice Amanda Hollman-Cook. 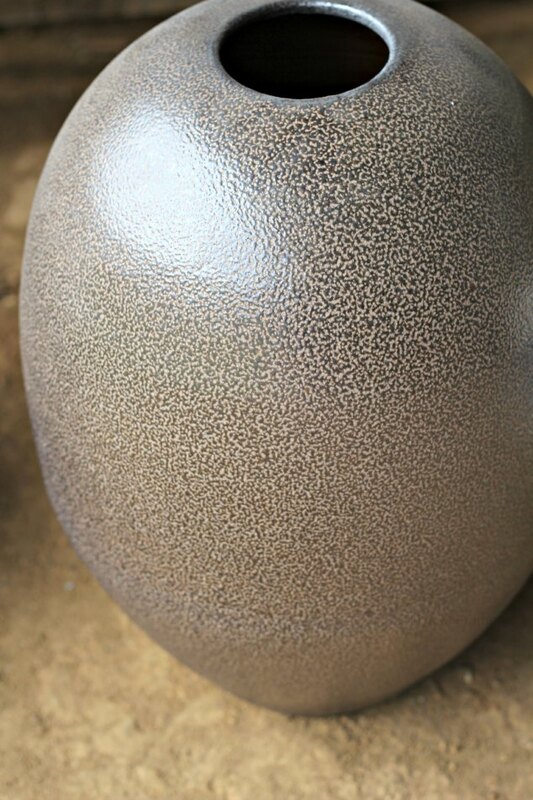 I am a pottery novice and was quite nervous, but that, I would learn, was a lesson in futility. In my short time at East Fork, I received an education that would have taken days sitting in a classroom. Amanda greeted me, taking me into the workshop where Alex was adding the finishing touches to a large piece. It was magical. I remember playing with clay in the creek below my Grandparents house, and my 70’s era ashtrays wept at the skill and talent on display in front of me. With laser focus and sure hands, Alex completed work on the large piece gently turning on the wheel, craftsman and raw material were one. A blob of clay transformed while I stood transfixed, awestruck by a master who has honed his skill to perfection. After work on the piece was completed, Alex and Amanda moved it to dry and I am pretty sure I held my breath from start to finish. As Alex, John and Amanda move about the workshop, they answered my questions and allowed me to snap photos of their work. As I watched the extruder take blocks of clay and transform it into ropey clay logs to be carefully manipulated and shaped into another large piece (about 4+ feet tall), all while wishing I had a degree of patience these artisans possess. 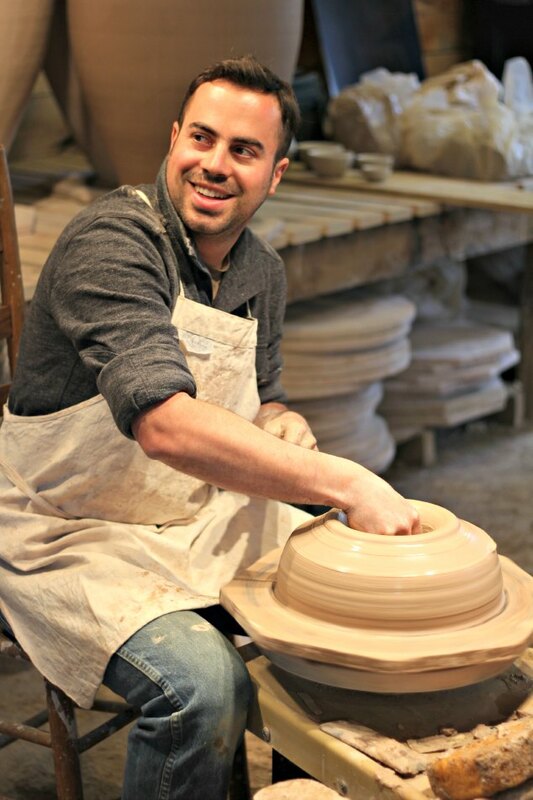 Having the scope of imagination to be a potter is one thing. Creating an item from a lump of clay while in constant motion is another. 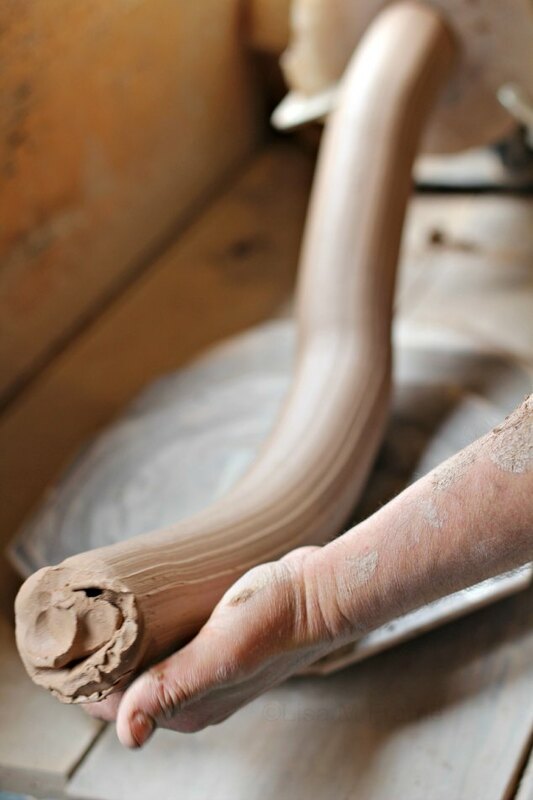 The wheel is rotating the soft clay while it is pressed, squeezed, and pulled gently upwards and outwards into a hollow shape. I watched as Alex centered the clay, smacking, squeezing and working it until it was ready for him to create the opening in order to start the throwing process of pulling and shaping the walls to an even thickness. All of this was done while also trimming the excess to create a foot (bottom.) Pottery creation is equal parts brutality and finesse. John was experimenting that day. Like Alex, he is a quiet man with soft eyes and laser focus. His style is much different from Alex’s, softer, yet it is definitely “his.” When you see the work of an artist, and then meet the artist, you can glean so much by just shaking their hand and saying hello. Their art is who they are and they pour their soul into it and it is that soul living and breathing in each piece. I left Alex to his work and followed Amanda to explore the kiln. (The photos don’t do it justice.) 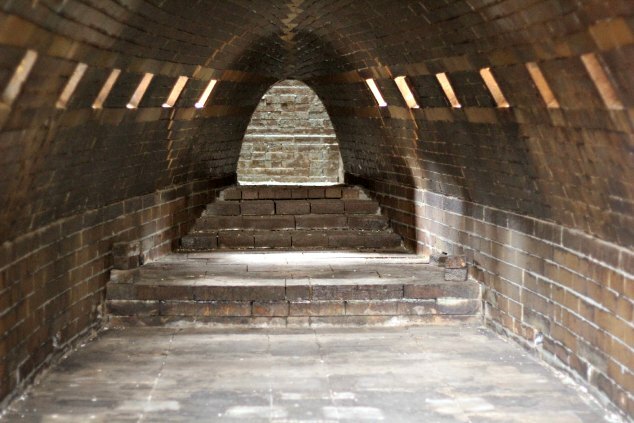 Imagine a large brick oven that would bake a 34ft long pizza. I’m 5’5″ tall and had more than enough headspace left over as I stood inside this massive structure. Soon it will be fired for the 17th time, using all of the wood you see in the photos here, and much more that is out of sight. While we were at the kiln Amanda explained the process of how it is heated in increments as they work six hour shifts, until it is necessary for everyone to work continuously. Smaller pieces sit on wads on the shelves inside the kiln, as well as on wads on the floor, while the fire is constantly stoked over the course of many days where it will reach 2500 degrees. This is a labor intensive, demanding process, requiring time and patience. 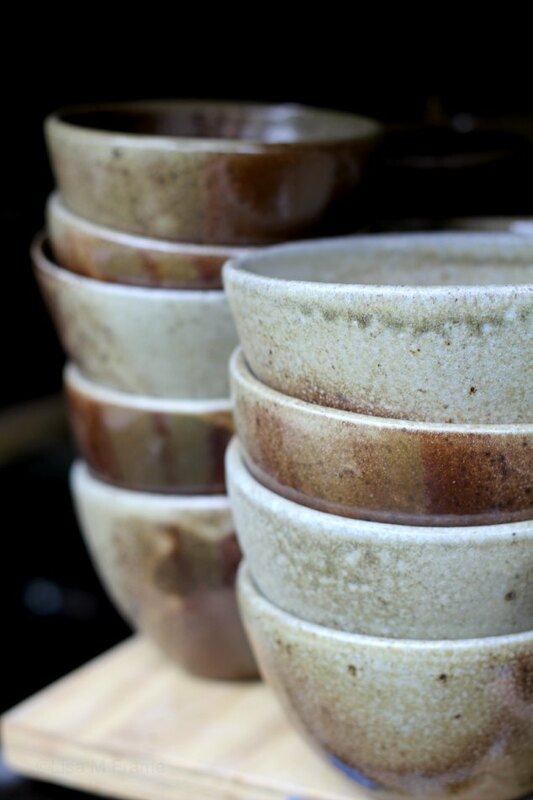 At at certain point in the process, salt is blasted into the kiln and the pots develop the beautiful glazed sheen. 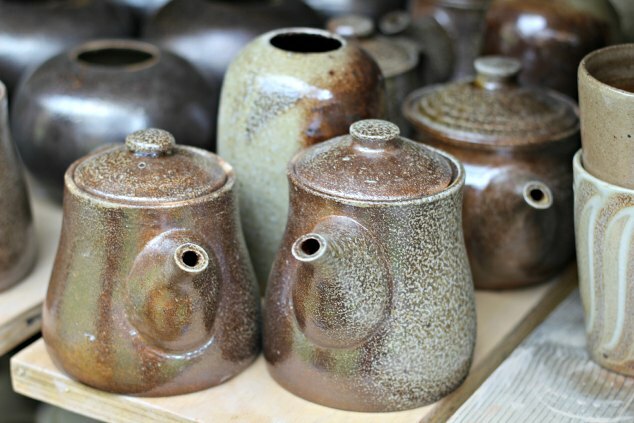 This creates a unique, natural process driven surface on each piece sought after by potters and collectors. I personally prefer what I now know is the “orange peel” pattern created by salt glazing. After we explored the kiln, Amanda answered my questions about the types of wood used (pine) and how long was each symmetrical piece (4 ft). We then strolled down the hill to check out Amanda’s work sitting on display at one of the storage buildings. She is coming in to her own right as a working potter, interning and learning the business side of the craft. Her enthusiasm is contagious and it is that enthusiasm that has led me to order several books about the craft and chemistry of pottery. I found myself headed down the mountain, filled with unanswered questions and even more intellectual curiosity. I’ve even checked out a pottery class at my local community college and am considering taking one in the fall. That will have to wait until after I head up the mountain again for an extended series of interviews with the East Fork Pottery crew. Visitors to Asheville will have a new store opening by East Fork soon in the River Arts District. Sign up for updates by clicking here. Great beer under Carolina blue skies is right up our alley over here at Handmade NC, and we want to talk more about great North Carolina beer. In 2009, the beer scene in Charlotte was limited to big brands with little imagination. That changed when John Marrino opened Olde Mecklenburg Brewery in 2009, leading what was to become a booming business across the Charlotte region. North Carolina now has more craft breweries than any other state in the South. Ilina and I both enjoy a good beer and love that craft beer is a seasonal affair. We go from saisons in the spring to summery IPAs, Oktoberfests in the fall, and round our palette out with stouts and porters in winter. When I’m looking for a new beer to try, I personally head over to my favorite Charlotte purveyor, Brawley’s Beverage on Park Road. Just how many breweries does Charlotte have? To be quite honest, I’ve lost count. But Charlotte’s Got A Lot has a list of all the breweries in the Charlotte metro area, as well as breweries that will be opening soon. Each one of the breweries are unique, all bringing their own style to the Charlotte beer scene. 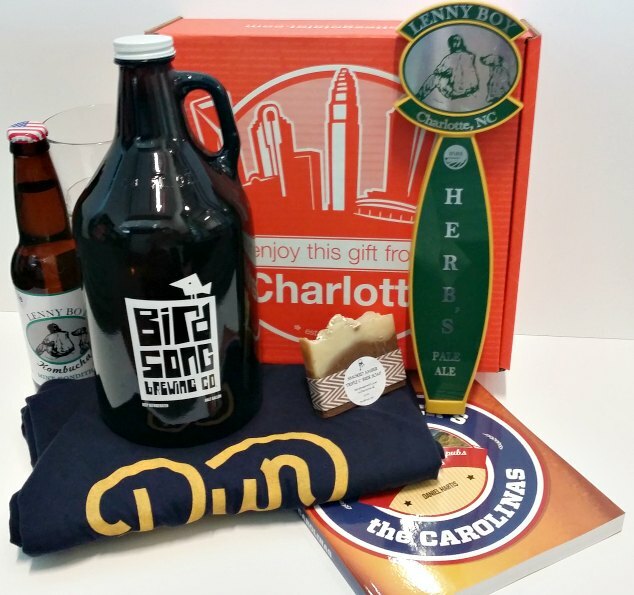 To celebrate North Carolina’s Brewconomy and the Charlotte craft beer scene, we are going to give away a fun package from Charlotte’s Got A Lot, the official travel and tourism resource of the Charlotte metro area. Entrants must be 21 and over to enter and live in North Carolina. Do you want to learn more about the Charlotte Craft Beer Scene? Click here to go to the landing page over at Charlotte’s Got A Lot. There you’ll find out more information about Charlotte breweries, beer and bottle shops, festivals, and beer tours. Everyone has their favorite decadent treat(s). Mine are bon bons and sea salt chocolate butter toffee from The Secret Chocolatier in Charlotte, NC. Owned by the Dietz and Ciordia families, The Secret Chocolatier was conceived when Chef Bill Dietz found himself at a career crossroads. He called a family meeting with his wife, Karen, their daughter Robin Ciordia and her husband Andy, and the four foodies decided to take the plunge into entrepreneurship. Three years later, after building a following at local farmers markets and retailers, they responded to public demand for a storefront where customers could get their chocolate moment five days a week. Their use of American craft chocolate, which is chopped and melted with hot cream to be whisked into silky ganache is a beautiful assault on the senses. It is full-bodied with a character akin to Frank Sinatra’s stage act. Saucy, yet robust. Combine that with fillings created in house from all natural ingredients, with nary a flavoring oil or extract in sight, and you have a chocolate ready for its Academy Award. Andy and I met on Twitter in 2007 and struck up a fast friendship. When I heard about this tasty venture, I headed over to the Atherton Market in the South End section of Charlotte to test their wares. My first purchase was chocolate brownies. What’s so special about a chocolate brownie? When it is the perfectly sized three inch brownie enrobed in creamy chocolate creating a bit of heaven in every bite. More importantly, it passed the test of the pickiest chocolate connoisseur I know, my son. 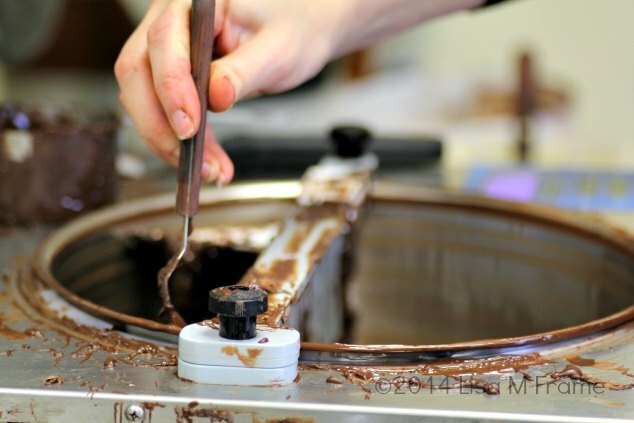 I spent some time at The Secret Chocolatier before Christmas and learned how to make some of their products. It is a laborious process filled with love and marked by serious craftsmanship. During the time I was there, we created vanilla bon bons. The time to create these delectable treats is one and a half hours from start to finish. It doesn’t matter if it is one bon bon, or twenty dozen, that is how long the process takes. Tempering chocolate at The Secret Chocolatier in Charlotte, NC. 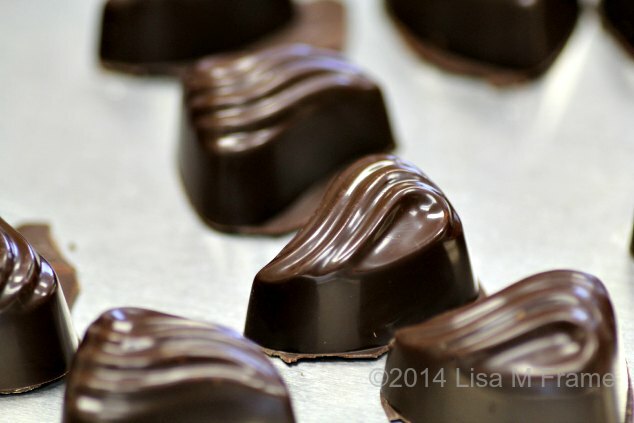 The entire premise behind The Secret Chocolatier is to create artisan chocolates. Chocolate is a family business and the Ciordia and Dietz families want their customers to feel like they are part of the family as well. Amazing corporate gifts are created via the concierge service, along with unique wedding ideas that will satisfy any bride. You can find The Secret Chocolatier at the locations in Charlotte (listed below) or order online from their website. 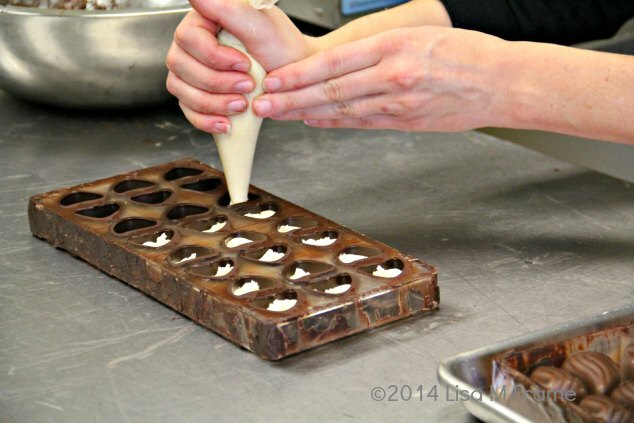 Bon Bons being filled by hand. Ever tried toffee? I made a happy discovery and found Chapel Hill Toffee while in my local grocers and picked up a box all in the name of research for Handmade NC. Instead of tearing into the box in the car, I brought it home, plated a piece (or three), and sat down to taste test this gorgeous, sugary confection. Chapel Hill Toffee is definitely a family affair. Karen Graves had perfected her toffee recipe and decided to open a small home-based business. She made her retail debut at A Southern Season in Chapel Hill in 2006 and soon after (2008) son Mark joined her in the kitchen to help scale their business. His wife joined the Chapel Hill Toffee team in 2012. What started as a cottage industry in North Carolina has grown to a much larger family business with products now in 400 retailers across the country. 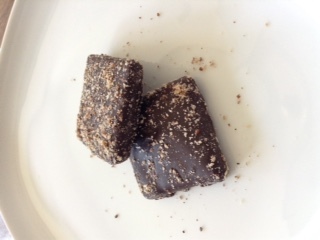 On first appearance, the toffee is a perfect square, robed in dark chocolate and dusted with finely chopped pecans. When you smell the toffee, you are smelling the deep dark cocoa and pecan. The first bite gives you a hint of good dark chocolate and a slight nutty flavor. Not enough nut to overwhelm your palate, but just enough to enhance the dark chocolate. The real surprise is getting through the thin layer of chocolate and getting the first hit of English toffee on your tongue. Imagine your taste buds coming alive and you’ll understand what you will find when you try Chapel Hill Toffee. The dark, earthy chocolate with its hint of truffle, mixes with the depth of the pecan. These flavors meld with the smoky, sweet, caramelized sugar used to create the toffee, with an unexpected hint of salt from the caramelization process. The toffee was brittle enough to have a satisfying crack, but not so brittle that you think you are going to break a tooth when biting into it. 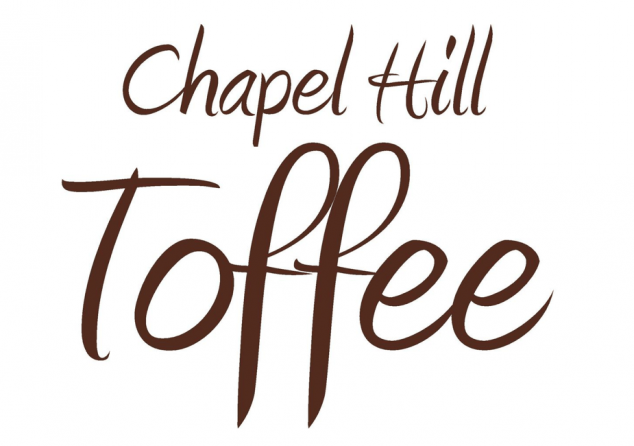 You can find Chapel Hill Toffee in select retailers on their site www.chapelhilltoffee.com. To order online, head over to http://www.chapelhilltoffee.com/shop/. Disclosure: This post was not sponsored. I bought Chapel Hill Toffee at my local Whole Foods and am quite happy it made it home for me to do a proper taste test. If you see me devouring toffee at the red light the next time I leave the grocery, please look the other way. I don’t want you to witness such toffee savagery. I’ve been thinking about the textile factories that dotted the North Carolina landscape with plumes of steam coming up from their boilers. More specifically, I’ve been thinking about Cone Mills. You see, my entire family is deeply tied into textile manufacturing. Part were Southern coastal landed gentry, the others Scots-Irish who settled in Appalachian mountains and made their way down to the Foothills of North Carolina. Those who dwelled in the Foothills were either farmers, military, or textile workers. They were proud people who worked very hard for their living. Textile jobs were dirty, loud, potentially dangerous and tough on the body. My late maternal Grandfather was a fixer, and my paternal Grandfather, a weaver. My late paternal Grandmother was a spinner, and my living maternal Grandmother worked in the supply room. My aunt was a doffer. My Father worked his way up through the textile factories in North Carolina to upper management. I could make a super long list that would bore you to tears about my extended family and their roles in textiles, but I shall refrain. As a little girl, I remember visiting the different factories my family worked at. I was never allowed in when they were operating, but on the rare times they were shut down (the first week in July and Christmas) I would get to see the inner workings. The smell of cotton and machine oil from these visits is something that will never escape me. It is similar to what you smell when cleaning a gun, but different. Less oily, more earthy. There was also a metallic smell from the multi-ton beasts that took raw cotton fibers and turned them into denim fabric. Smells are something we associate with throughout life. They trigger memories, good and bad, and no matter what, stick with us in such a profound way that, even years later, can rattle us to our core. Even now, when I smell certain scents, I’m taken back to the smell of the cotton mills and the fabric sitting on their looms. Really, the fabric I’m thinking of is “selvage” denim. An item so popular, jeans made with it today start upwards of $150 dollars each. Most of this “blue gold” is made at the Cone Mills White Oak plant located in Greensboro, NC, and favored by mainstream retailers like Gap, American Apparel to boutique brands and iconic clothing manufacturers such as Levi. Frankly, I was stunned at the prices commanded by selvage denim today. After all, it seems like yesterday I was a young girl walking among the machines, tufts of spun cotton the floor and machines that wove fabric stopped mid-weave. Cone Mills Corporation was the world leader in the manufacturing of denim and largest supplier in the world. * Their employees were proud of their work and I’m happy to see Cone still has one plant still running in North Carolina. The hulking ghosts of their empty factories are a consistent reminder of when things were truly Handmade in North Carolina. Tonight North Carolina is mourning the loss of legendary University of North Carolina Chapel Hill basketball coach, Dean Smith. It does not matter if you are a fan of rival basketball programs, Dean Smith is a name you know and respect. Originally from Emporia, Kansas, Coach Smith had a 36 year coaching tenure at the UNC-CH, retiring with 879 victories, 2 national championships and 11 Final Fours. In short, he created a basketball dynasty for the University of North Carolina that is still going strong today. A big proponent of desegregation, Charlie Scott was recruited by Coach Smith and the became university’s first African-American player to receive a scholarship to play while attending UNC-CH. Most don’t realize that UNC-CH was still rigidly segregated in 1959. Smith came to Carolina in 1961 and by 1966 Scott was playing for UNC. To give backstory to Smith’s integration work, in 1964, he joined a local pastor, Robert Seymour, and a black theology student to integrate The Pines, a Chapel Hill restaurant. Smith was still an assistant coach at the time, but they walked to the restaurants and waited outside until they were seated. The following year, he helped Howard Lee, a black graduate student at UNC, buy a home in an all white neighborhood. Coach Smith retired in 1997, no longer able to give the enthusiasm needed to coach a program like Carolina. He still advised the Carolina basketball staff and worked tireless in his community. On July 17, 2010, his family released a statement that he had a “progressive neurocognitive disorder” and from then on, spent his last years quietly out of the spotlight. Dean Smith was a memorable man and touched everyone who met him. He was a true leader in the state of North Carolina and that is what will stick with us. More than basketball championships or Final Four appearances, Coach Smith gave himself to North Carolina and served our state with selflessness, strength of character, and leadership. For that, we shall always love him. “MichaelJordanDeanSmith” by Zeke Smith from Chapel Hill, NC, USA – Michael Jordan, Dean Smith. Licensed under CC BY-SA 2.0 via Wikimedia Commons. In honor of Black History Month in North Carolina, I’m going to kick things off with Romare Bearden Park located in Uptown Charlotte. (Not to worry, Handmade NC will be sharing more about the life and works of Mr. Bearden later this month.) This 5.4 acre public park is named in honor of Charlotte born artist, Romare Bearden, and opened August 2013. When life has been hectic, Bearden park is a spot I find myself at time and time again. Always changing, I like sit and study the sections while I host an internal debate on which pieces of Bearden’s work are represented in different sections as I stroll or sit on one of the many benches available to visitors. My husband works one block away from this gorgeous spot and it is one of our favorite meeting places for lunch. Bearden was born in 1911 in his great-grandparents’ house at the corner of Second (now MLK Jr. Boulevard.) and Graham Street in Uptown, a short walk from his namesake park which is based on Bearden’s collages and paintings, a creative music “playground” and a colorful waterfall that has become a popular photo backdrop. Plants and flowers were planned to bring to life the work of Bearden through nature. Among the lush landscaping, you find fitness classes, impromptu jam sessions from local musicians, workday lunch breaks, romantic strolls, planned festivals, and inspiration. Evoking Bearden and his use of memory as triggers for past experience, the elements of the park represents how he worked and the imagery he used to channel the spirit of his life and artwork. To learn more about Romare Bearden Park and the concepts behind it’s development, please visit the Bearden Foundation. Romare Bearden Park is located at 300 S. Church Street, Charlotte, NC. Many thanks to James Willamor, founder of Croquet Records, a nonprofit record label and songwriter incubator focused on developing and recording new and emerging artists in North Carolina, for the stunning images of Romare Bearden Park used in this post.